People often wonder what our life is like. Our lifestyle is not totally unique, but it is very different to that of the vast majority of people I know. We have moved 11 times in the last 7 years…that’s a LOT of moving! Why, you ask? We cannot afford to buy a house – we do not earn enough to get a mortgage – and neither would we want one. The idea of working our whole lives in order to pay a mortgage fills us with dread. So we’ve rented – normally we go for the cheapest – which was mostly short term lets. Other times we’ve intended to stay long term, but our bills worked out to be unsustainable, or we just weren’t happy. We were having to claim housing benefit and having more and more drama with the fact that all estate agents in our area would not accept anyone on Housing Benefit, and most private landlords were wary of HB too. Basically, the Council provided a system which didn’t work for us. And neither were we happy depending on it. We are happiest close to nature, some of our fondest memories whilst Wwoof’ing. The simple life is for us…so when I found a part time job available as personal assistant and event organiser at a daycentre for adults with special needs, on an organic farm…well, this sounded like heaven. I got the job and a few months later we moved onto the farm. We lived in a touring caravan – where we built a small top bunk above the single bed so that we each had somewhere to sleep. It was hubby, myself and our 2 girls at that point, but I was expecting… As ‘nesting’ kicked in and began to worry about how I was going to cope with 3 children in this square metre(or less) of floor space. I opened my email one day, and there was an email from a local forum I belong to about someone selling a large shed for £600. I immediately called and we went to see it and bought it straight away. The man who we bought it from was a builder and he told us it’d take a day to take down and a couple of days to put up. Well, we aren’t builders – and it took about 6 months to rebuild it and make it habitable – we had the learning experience of a lifetime! We employed a builder here and there to get us started on the things we didn’t know how to do, but mostly we (or rather, my husband) built our house with his own bare hands. There is a huge sense of achievement in that alone, and even though it was stressful we feel really grateful to have had this opportunity. We do an exchange – we work a few days a month in exchange for our beautiful piece of land – above an apple orchard and overlooking a valley…what more could we want?! 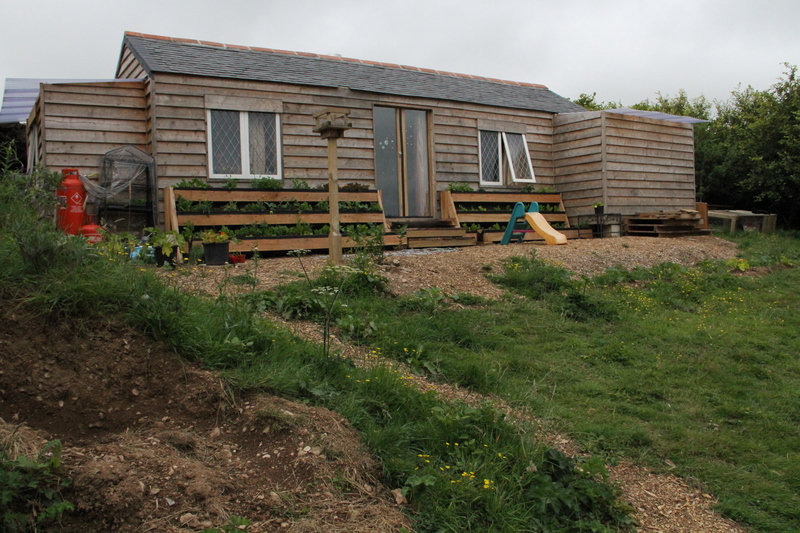 I will save the details of the build for another blog, but suffice to say that our house cost more than £600 in the end – as we took advice to use new cladding (we chose larch as it doesn’t need to be treated). We used recycled/reclaimed things wherever we could, and learnt many a lesson on the way…. We get our little bit of power from solar panels – not enough to run a fridge, so we do without one. When there’s no sun, we have no power…although usually the panels will charge a bit, even on an overcast day. Our loo consists of a shelf, with a toilet seat on it and a bin underneath. The bin gets emptied into our compost bins and will be eventually used as ‘humanure’ to feed our plants. During the year we spent in the caravan we had no toilet, although there are toilets on the farm – so having a compost loo of our own feels like a luxury. We have a second hand gas cooker – one that someone was throwing out because the exterior is starting to rust. Our heating comes from our woodburner, and wood is something we have no shortage of on our farm as the farm gained loads of salvaged wood from a fire on the Falmouth Docks. It of course has to be collected and chopped, and fires are now becoming part of our morning and evening ritual. The girls love to help light it and little Leander loves to blow out the match. We are very fortunate to live on the same farm as Zelda School, which is a unique school with a beautiful philosophy, run out of two yurts. The girls go there 3 days a week. I work those 3 days, whilst Hubby looks after Leander. Hubby works on weekends, as a Support Worker or Health Care Assistant (the money is best on weekends – which frees him up during the week) We have 2 family days during the week, in which we try to cram a bit of one-on-one time with the kids, home schooling ideas, and outings – amongst breastfeeding, meals, my self-employed work and other voluntary jobs I seem to accumulate. We like to grow our own food although we haven’t done too much this year – but that is something to work on in the years to come. There are polytunnels on the farm, so when in season – we have an abundance of tomatoes, courgettes and runner beans. We love being so close to nature, and we love that we are off grid and not dependant on the Council for housing benefit. We love that we have pretty much no massive overheads or bills. Even so, money is tight – petrol and food being our biggest expenses – but we would much rather be a little short of money and be able to share childcare and experience our childrens childhoods with them…it goes so fast! Don’t be disillusioned however, this lifestyle is not for the faint-hearted. There is no switch to flip when it’s cold…and if baby has a poo explosion there’s no warm bath to plonk him in…but these things make you think about and realise how much energy and time goes into things that most people simply take forgranted. It makes us realise how wasteful we have been in the past, and how we need to look after our resources more carefully. This is not always an easy lifestyle – but it is a beautiful one – one where I feel so much more connected to mother earth and where my children are free and happy. So that, in a nutshell, is our low impact lifestyle! Bravo, Sharon, for walking the talk. And what an inspiration to your children. Wow, that is definitely a life less ordinary 🙂 I’m impressed! Way to go! If only more people would go for this lifestyle the Planet would be a much cleaner place.